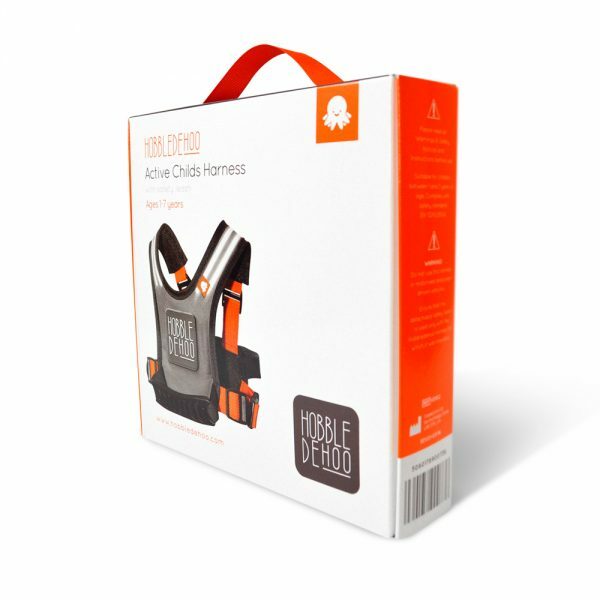 Hobbledehoo 2 Active Childs Harness – Ski Harness – Kids Harness for everyday safety and activities. Front and rear grab handles to catch then when they stumble or to pick them up when they fall. Easy adjustablility with clips around the chest. Quick release straps over shoulders that extend over helmets for ease of getting on and off. Twin clipped detachable safety leash for using when close restraint is required. Leash extends to a single handle to hold. High visibility reflective shoulder stripes and rear logo for dusk hours and low visibility occasions. 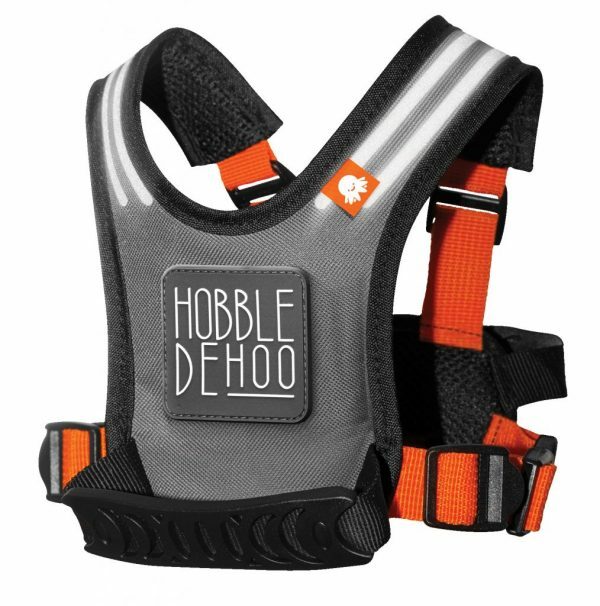 The Hobbledehoo 2 Active Kids Harness provides a suitable harness for holding, grabbing or picking up your child for full control over your active little ones, Ideal for ages 1-6 years. Tried and tested on toddlers wearing wetsuits while around water for a safe and secure grab handle (have you ever tried to catch a slippery, wriggly child in a wetsuit?). Gives peace of mind when they are jumping in the small waves near your feet as you can easily grab hold and take control if they slip over, which they will, again and again! Used daily while out walking as toddlers trip and stumble over every small thing but must be independent and walk on their own. Use while travelling on public transport; especially on the London Underground system as it allows the child to walk independently but you have full control to keep them upright at the speed of the flowing traffic even up and down the stairs and knowing they cannot fall, trip or stumble to the floor or near a train. 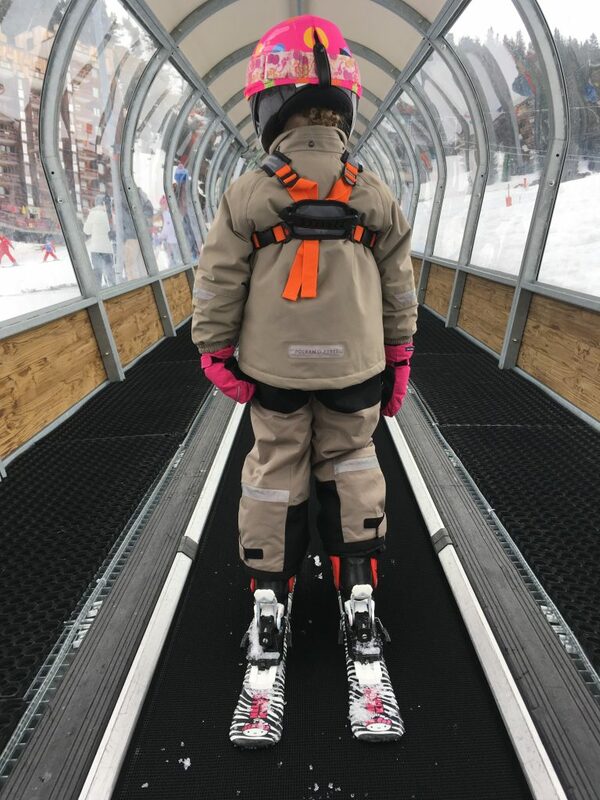 Ideal for skiing as on ski lifts you have full, secure control of a child without having a handful of clothing. 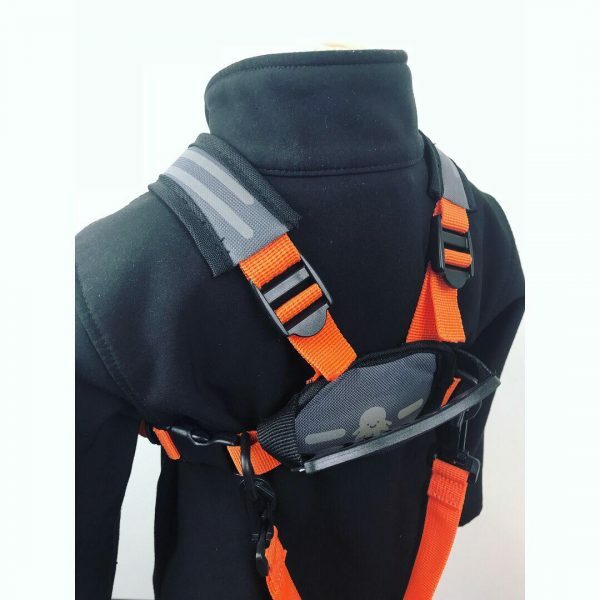 The best thing about the design of the harness is the height of the double handles; most adults can have their fingers around the rear handle with little stooping or bending, continue walking with the child but the slightest stumble or trip can be caught before they hit the floor. If they do reach the floor, picking them up is so much easier as you don’t have to stoop down all the way to put hands under the arms and pick them up, you just lift the rear handle and with its height the child’s legs naturally fall back to the floor and they just drop onto their feet. Much quicker, simpler and a lot less demanding on an adults back! The leash is 1.2m fully extended from the child to the tip as this is the maximum allowed to obtain the British standard BS EN 13210 standard for the safety requirements of Children’s harnesses and reins. 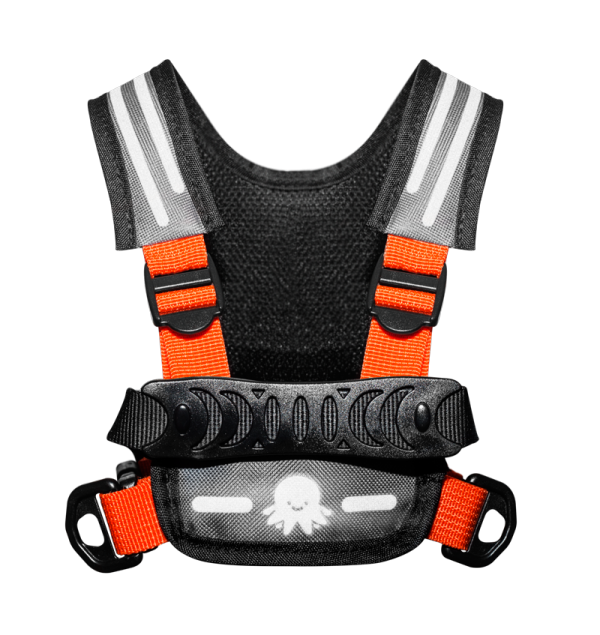 The chest straps can extend to make the harness 13″ flat width comfortably so could say that it will fit up to a 26″ chest easily, possibly 28″. There should be no issue with the shoulder straps as it extends enough to fit over a helmet. The weight is tested to 120N so should withstand up to a 6 year old. Our returns policy is very good, if you try it on carefully and it doesn’t fit then happily return it to us and we will refund you as long as it is in the same condition as you would expect to receive it yourself. 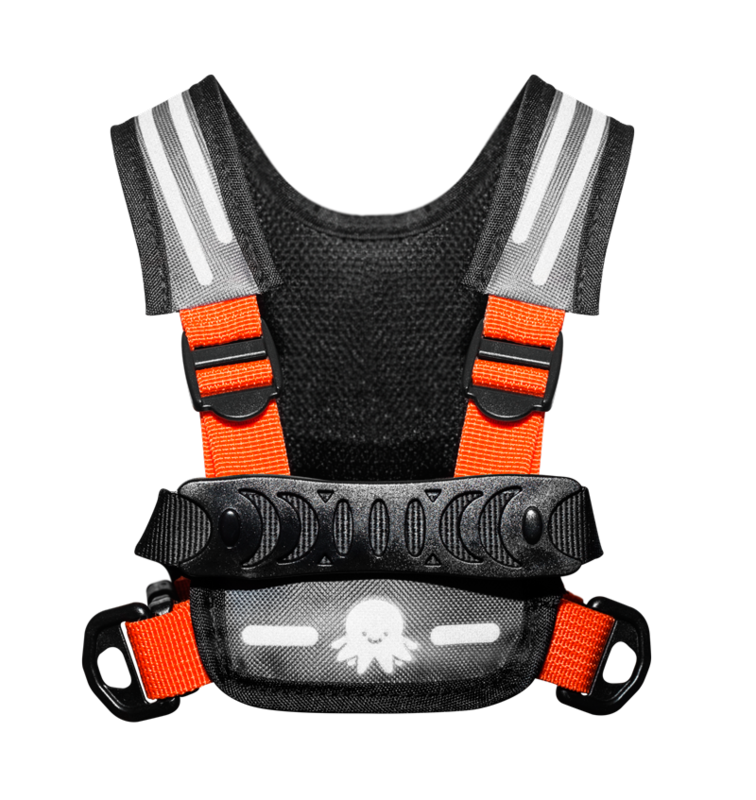 21 reviews for Hobbledehoo 2 Active Childs Harness – Ski Harness – Kids Harness for everyday safety and activities. Our daughter S is 20 months now and very much an independent woman, she knows what she wants and is very clear in letting us know about it! Recently she has wanted to walk more and more which would be fine, but unfortunately she refuses to hold our hand a lot of the time and out right refuses to wear her old animal backpack with reigns – so most of the time to keep her safe near roads or in busy areas, we have to confine her back to the pushchair or carry her for peace of mind. 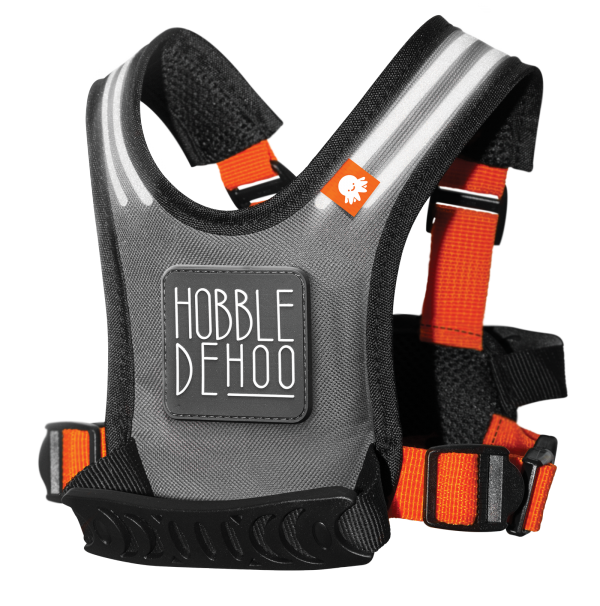 I saw an advert on Facebook for Hobbledehoo which looked like a much more structured harness and I was kindly offered one to try out for review here. This could go one of two ways – either she would let us put it on, or she would scream blue murder and I would post it back with my apologies. Much to my surprise, not only did S put her arms up to have it put on voluntarily, she allowed us to buckle it, tighten it and attach the straps for our walk. Gobsmacked. I wondered what kind of crazy sorcery this harness included – it actually made her happy! This is a toddler that for at least the last 6 months has refused anything vaguely restrictive or ‘baby’ like, such as high chairs, trolley traps and the other kind of back pack harnesses so this was a good sign! 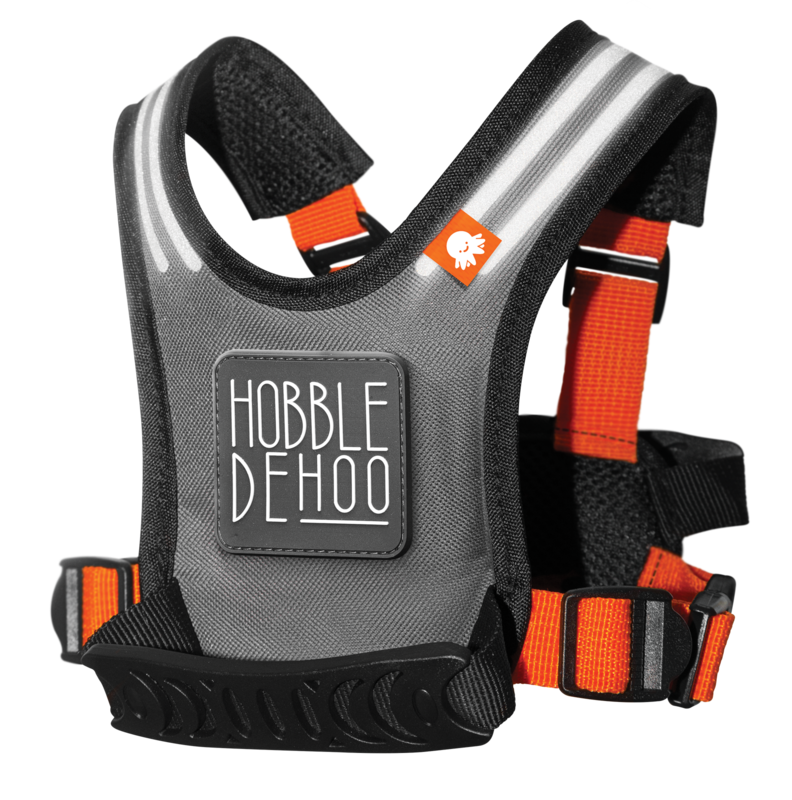 Hobbledehoo goes onto the child like a vest which can then be tightened to fit snuggly around the body. This is seriously well made and robust and lightly padded for comfort. The straps tightened and loosened very easily and quickly which is pretty essential with impatient toddlers craving their adventures and all clips are really solid too. These harnesses have a nice solid handle on the back and front, perfect for helping your little one up whilst allowing them to do half the work. We haven’t really used these a great deal, but found it good to have that extra ‘grabbing’ point when we needed her to stop at the roadside, or super stay close by. 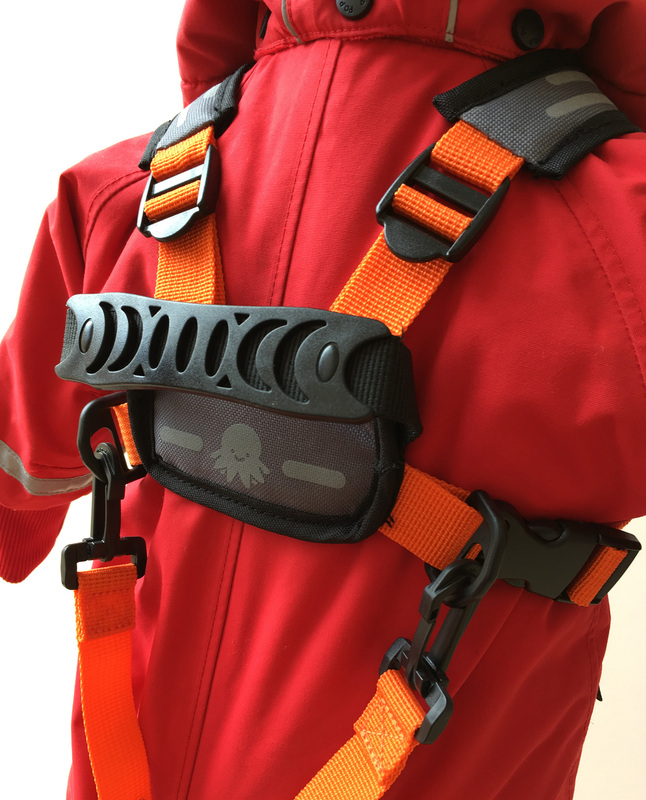 The strap has one handle that splits to two clips to support the harness on your walks. The strap material is very thick, well made and soft but I would have liked to have seen a more robust grabby handle like the ones attached to the front and back as I found this harder to grip. The good thing about it being a plain loop is that it makes it easier to loop round and round your hand to shorten the strap, so there are definitely pros and cons to the strap design. For me though, this didn’t let it down at all in use, I just always try and find something that I would maybe change in a review if I can. I am completely blown away at how much S has enjoyed using this harness and getting a little freedom. We have only had one tantrum which was when we tried to carry her through a busy crowd in town, so nothing to do with the harness! Otherwise, this has really been a bit of a godsend for us and I know if she could tell us, S would say she loves this – hopefully the pictures show that instead! This is so much better than the backpack style one we used with our son (and attempted with S) as we found those always rose up and if they fell over it came right up to the neck and cut in the armpits. This fits so nicely on the body – it’s kind of the human equivalent of a dog harness VS a collar and lead – it’s safer, much more comfortable for the child and the reigns can simply be detached when they sit down or pop off to play. From the second we tried this, we have had no battles with S to put this on – I think she knows it’s her best alternative that offers the most freedom! We battle to get her to wear anything that isn’t pink, to wear shoes that don’t have a bow on and to let us brush her teeth and hair, but luckily with the Hobbledehoo we have one less battle on our hands and it’s great! Big thumbs up from us. There is so much fun to be had! The handles on this are really robust for picking them up with and the straps are padded enough so as not to cut into them – a great versatile piece of safety kit but most importantly for any 3 year old – it looks cool! My son had to have an eeg the other day he never sits still I managed with this on to keep him on my lap. He also has additional needs and has no sense of danger most of these harnesses are way too small. P’s I don’t think we actually ever leave the house without it! Thank you for giving us a Hobble de Hoo after meeting you on the slopes. It has been great for our daughter who is Autistic. This really gave her the freedom to enjoy skiing. It was especially good for us on the lifts were it gave us additional security being able to keep hold of her. Thank you so much. Thank you again for the trial harness you gave us today in La Plagne. What a great idea, it made our day skiing with our 3 year old so much easier. She loved it too and the fit is discreet and comfortable. It made her more confident and helped her master her first solo run by the end of the day. I will certainly recommend to friends. All the best. Fantastic product!! Much loved by me and my 2 year old. He is very happy to wear this and I have such great control. If he stumbles I can simply correct him on his feet, and if he completely falls over the harness design enables me to pick him up with ease. Also I found this to be excellent with scooters. Enabling my child to freely scoot due to the lengthy rein but still have control of him. I would highly recommend the hobble de hoo to any mums and dads with toddlers! We used two hobbledehoos whilst skiing over half term. It was great for helping our 4 year old ski – we used the handles to haul him up slopes and pick him up when he fell and the reins were great for keeping his speed under control as he practised. On our nearly two year old it was essential for picking him up off the snow as he struggled not to fall over in all his warm clothes. Fantastic for when you’re wearing gloves and they’re wearing slippy clothes as the handles are so easy to get hold of. The handles are very strong, we even used them to carry our youngest! Great product and had people asking me about it too. And the kids enjoyed towing each other about. They have been very useful and I can see us using them a lot for other activities (sailing etc). He think it is quite cool and wasn’t bothered about wearing a harness (for surfing). It seems really strong. We can easily lift him off the ground with it and he is in aged 9-10 clothes. Would definitely recommend it. Having the hobbledehoo for them has been brilliant, I can’t put into words what a change it has made when I want to go somewhere and they want to walk, I now can let them and know I will have a free hand to deal with my other children. The grab handle at the back is fantastic as when one child decides to lie on the floor I can just pick them up with the handle and will still be holding the other baby’s hand. The detachable strap is brilliant as I can take it off when the boys can be free to run around then just clip it back on when I need to. I am even managing dog walks with my five year old safely holding one baby’s hand next to the road whilst I have the other baby and dog. I have had a lot of comments off other parents about how nice they look and well designed. They have also been easy to adjust to a four year olds size when he decided to misbehave one day! We have recently started using Hobbledehoos with our three year old twins and absolutely love them. We had no success with other types of reins (refusal to walk, too short a rein, too small for them etc) however these are clearly more comfortable for them. It’s also great to know that the product will grow with them as both boys have mobility issues and have no danger awareness so they will give us peace of mind. I also love that the product is still really useful when not using the rein part. The ‘grab handles’ are such a great idea. Really recommend and I’m sure our kids would too! Brought for a 7 yr old special needs child who has no awarness of danger. 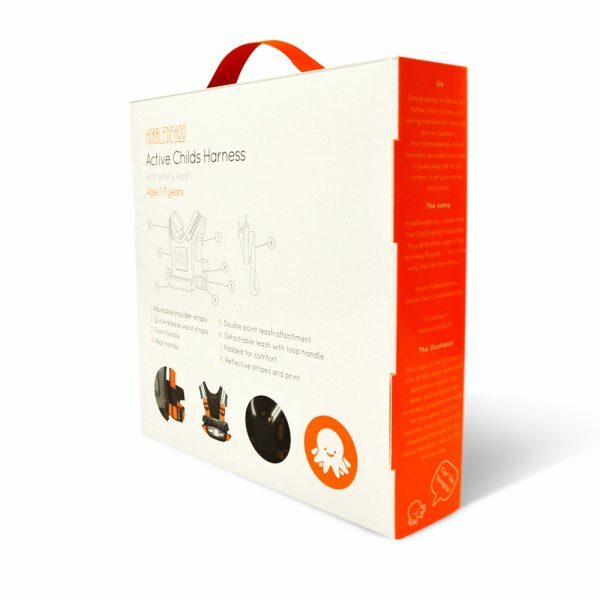 These are strong well made and works great with handle on the front and back to lift and hold on to the child when meltdowns ensue. The length of the “lead” is perfect for him to feel some independence but still safe, cant say how great this is. Excellent product! Arrived quickly through the post and was well packaged. Brilliant communication with Hobbledehoo about my order. Can’t wait to try it out in the snow this winter with the children when skiing! Thanks! This is a really good product; it does what it says. Our grandson 23 months is extremely active and determined when running around and out walking. The straps are sturdy and the front and back handles are ideal when he roughs and tumbles.